A prenatal multivitamin can be a wise idea during pregnancy to cover any nutritional gaps in a mother’s diet. It should consist of the crucial vitamins and minerals formulated to your body needs and your baby’s needs such as vitamins A, B-3, B-6, C, D, calcium, iron, magnesium, manganese, and zinc. While pregnant or nursing you should also consider supplements with folic acid and fatty acids like omega-3, EPA, or DHA. Once your baby is older you should consider having them take a multivitamin for kids. The best pills will only use all natural ingredients, contain no artificial fillers, binders, colors, or flavorings, and contain no heavy metals. They should also be easy to take and not make your stomach upset. Some products include probiotics and enzymes to help make digestion easier. However, you might have to try different brands to find one that does not make you nauseous. To help us analyze each product we used the independent tests from labdoor.com which measured the label accuracy, product purity, nutritional value, and more. To make our final list we also read multiple reviews on all the top brands and combined all the information we gathered into one final rating for each supplement. Below we reveal the best prenatal multivitamin and review the top 6 choices for prenatal multivitamins. Buyers should be aware that the prices listed were the prices at time of publication and are subject to change. Amazon also offers subscription rates on many of these items for a pretty significant discount. At the bottom of this article we also have a comparison chart of each multivitamin with their amounts of each primary vitamin or mineral*. With this you can easily compare one prenatal multivitamin versus another. We also have a list of ingredients if you want to look into each product in even more detail. 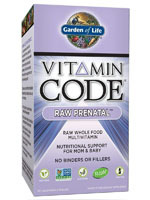 We selected the Garden of Life Vitamin Code Raw Prenatal Multivitamins as the best prenatal vitamin. A bottle of 180 capsules costs about $41.94 for a price per serving of $0.70 which is three capsules per day. These pills were ranked number one in quality by labdoor.com and are one of the best-selling prenatal multivitamins on Amazon. Vitamin Code Raw Prenatal vegetarian capsules use non-gmo raw, whole food ingredients with absolutely no binders or fillers. This product is specially formulated to provide nourishment to support both mom and baby through pregnancy and lactation. Some ingredients include 800 mcg Folate to support neural tube development, 18 mg iron, 23 organically grown fruits and vegetables for added antioxidants and nutrients, and ginger and probiotics to help morning sickness and digestive issues. 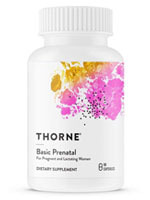 Another great prenatal supplement is the Thorne Research Basic Prenatal Multivitamin which comes in a bottle of 90 capsules for $27.00 or a price per serving of $0.90 for 3 capsules daily. Designed for women who are trying to conceive, pregnant, or lactating, this Thorne Research product contains key nutrients like 1 mg of folate and 45 mg of iron. The main advantage of this supplement is that it uses bio-available forms of vitamins and minerals that are more easily absorbed into your body. These capsules are additive-free and do not contain any wheat, gluten, corn, yeast, soy, egg, dairy, lactose, or artificial colors, sweeteners or flavors. Each package of 120 softgels of Zahler’s Premium Prenatal + DHA will cost you $61.72 which is a price per serving at $1.03 of 2 pills daily. That makes it the most expensive prenatal multivitamin on our list. This product is the only one on our list that combines a prenatal multivitamin with 300 mg of DHA which plays a role in brain and eye development, especially in fetal development and infancy. It also contains 1000 mcg of folate and 27 mg of iron. The nutrients are bio-active so they are absorbed into your body better. You can buy a bottle of New Chapter Perfect Prenatal with 192 tablets for $40.50 or a price per serving of $0.63 for 3 vegetarian tablets daily. Perfect Prenatal is made from organic, non-gmo cultured whole foods and herbs with live probiotics to support a healthy pregnancy. Each serving of the New Chapter Perfect Prenatal Multivitamin supplies 600 mcg of folate and 18 mg of iron. Users should be aware that New Chapter Perfect Prenatal Multivitamin contains fermented soy products. If you need a cheap prenatal multivitamin then you should consider the Deva Vegan Prenatal Multivitamin which sells for just $0.11 per serving of 1 tablet per day or $10.22 for the whole bottle of 90 tablets. This product is also only certified Vegan prenatal on our list, so it is also the perfect choice for anyone on a vegan diet. DEVA Vegan Prenatal Formula provides 138% of the recommended daily allowances of folic acid and over 1500% of the RDV of Vitamin B12, which can be difficult to get from vegan diets. 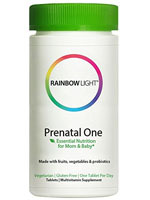 Rainbow Light Prenatal One is another one of the best selling prenatal vitamins on Amazon with a price of $41.96 for a bottle of 150 tablets. With a serving size of just 1 tablet that makes it one of the cheapest prenatal multivitamins per serving on our list with a price per serving of just $0.28. Prenatal One contains all the essential vitamins and nutrients needed for moms and babies throughout pregnancy and nursing including 600 mcg DFE folic acid, 27 mg iron, 15 mcg of vitamin D2, and more. Each tablet also has enzymes and probiotics to help ease digestion without causing an upset stomach. One important thing about Rainbow Light Prenatal One is what is does not contain. It uses no animal products, artificial colors, flavors, preservatives, or additives. It also does not contain any wheat, gluten, sugar, dairy, lactose, nuts, soy, shellfish, or yeast which makes it safe to use for anyone. Garden of Life Vitamin Code Raw Prenatal Multivitamin 9.3 $41.94 180 Take 1 capsule 3x daily. 3 60 $0.70 Yes No Vegetarian Yes 5000 IU 100% 60 mg 100% 1400 IU 350% 30 IU 100% 50 mcg 60% 1.5 mg 100% 1.7 mg 100% 20 mg 100% 2 mg 100% 800 mcg 200% 125 mg 13% 38 mg 10% 7.5 mg 50% 50 mcg 70% 18 mg 100% 0 Vitamin A (as beta-carotene) 5000 IU, Vitamin C 60 mg, Vitamin D3 1400 IU, Vitamin E 30 IU, Vitamin K (as MK-7) 50 mcg, Thiamin (Vitamin B1) 1.5 mg, Riboflavin (Vitamin B2) 1.7 mg, Niacinamide (as Niacinamide) 20 mg, Vitamin B6 2 mg, Folate 800 mcg, Vitamin B12 (as Methylcobalamin) 6 mcg, Biotin 300 mcg, Pantothenic Acid 10 mg, Calcium 125 mg, Iron 18 mg, Iodine 150 mcg, Magnesium 38 mg, Zinc 7.5 mg, Selenium 50 mcg, Copper 0.7 mg, Manganese 2 mg, Chromium 50 mcg, Molybdenum 75 mcg, Organic Vitex negundo (seed) containing mixed Tocopherols 4 mg;, RAW Organic Fruit & Vegetable Blend 870 mg:, Organic apple (fruit), organic beet (root), organic broccoli (stalk & flower), organic carrot (root), organic spinach (leaf), organic tomato (fruit), organic strawberry (fruit), organic tart charry (fruit), organic blackberry (fruit), organic green bell pepper (fruit), organic brussels sprout (leaf), organic bluberry (fruit), organic ginger (root), organic garlic (bulb), organic raspberry (fruit), organic parsley (leaf), organic cauliflower (flower & stem), organic red cabbage (leaf), organic kale (leaf), organic cucumber (gourd), organic celery (stalk), organic asparagus (flower & stem);, Prenatal Digestive Comfort Blend 77 mg: , Ginger (root and rhizome), [Lactobacillus plantarum, Lactobacillus bulgaricus, Lactobacillus rhamnosus] (6 billion CFU), Saccharomyces cerevisiae;, RAW Organic Sprout Blend 10 mg: , Organic Amaranth Sprout, Organic Quinoa Sprout, Organic Millet Sprout, Organic Buckwheat Sprout, Organic Garbanzo Bean Sprout, Organic Lentil Sprout, Organic Adzuki Bean Sprout, Organic Flax Seed Sprout, Organic Sunflower Seed Sprout, Organic Pumpkin Seed Sprout, Organic Chia Seed Sprout, Organic Sesame Seed Sprout; Other Ingredients: Vegetable cellulose (capsule), organic rice (hull). Thorne Research Basic Prenatal Multivitamin 9.2 $27.00 90 Take 1 capsule 3x daily. 3 30 $0.90 No No No No 1.05 mg 117% 150 mg 125% 25 mcg 167% 33.5 mg 177% 100 mcg 111% 5 mg 357% 5 mg 357% 30 mg 167% 12 mg 600% 1 mg 167% 180 mg 14% 90 mg 23% 25 mg 192% 50 mcg 71% 45 mg 167% 0 Vitamin A (450 mcg from Beta Carotene and 600 mcg as Palmitate) 1.05mg, Vitamin C (as Ascorbic Acid) 150mg, Vitamin D (as Vitamin D3) (1,000IU) 25mcg, Vitamin E (as d-Alpha Tocopheryl) 33.5mg, Vitamin K (as Vitamin K1) 100mcg, Thiamin (as Thiamin HCl) 5mg, Riboflavin (as Riboflavin 5′-Phosphate Sodium) 5mg, Niacin (as Niacinamide) 30mg, Vitamin B6 (as Pyridoxal 5′-Phosphate) 12mg, Folate (as L-5-Methyltetrahydrofolate from L-5-Methyltetrahydrofolic Acid, Glucosamine Salt) 1.7mg DFE, Vitamin B12 (as Methylcobalamin) 200mcg, Biotin 50mcg, Pantothenic Acid (as Calcium Panothenate) 18mg, Calcium (90mg as Calcium Citrate and 90mg as Calcium Malate) 180mg, Iron (as Ferrochel Ferrous Bisglycinate) 45mg, Iodine (as Potassium Iodide) 150mcg, Magnesium (45mg as Magnesium Citrate and 45mg as Magnesium Malate) 90mg, Zinc (as TRAACS Zinc Bisglycinate) 25mg, Selenium (as L-Selenomethionine) 50mcg, Copper (as TRAACS Copper Bisglycinate) 2mg, Manganese (as TRAACS Manganese Bisglycinate) 5mg, Chromium (as TRAACS Chromium Nicotinate Glycinate) 100mcg, Molybdenum (as TRAACS Molybdenum Glycinate) 50mcg, Boron (as BororganicTM Boron Glycinate Complex) 1mg. Other Ingredients: Hypromellose (derived from cellulose) capsule, Microcrystalline Cellulose, Calcium Laurate, Silicon Dioxide. Zahler Prenatal Vitamin + DHA 9.2 $61.72 120 Take 1 softgel 2x daily with meals. 2 60 $1.03 No No No No 5000 IU 63% 100 mg 167% 2000 IU 500% 60 IU 200% 80 mcg 100% 15 mg 882% 15 mg 750% 30 mg 150% 25 mg 1000% 1000 mcg 125% 34 mg 3% 20 mg 4% 11 mg 73% 35 mcg 50% 27 mg 100% 300 mg Vitamin A (as 83% Beta Carotene and Retinyl Palmitate) 5000 IU, Vitamin C (from Calcium Ascorbate) 100 mg, Vitamin D (as Cholecalciferol) 2000 IU, Vitamin E (as d-Alpha Tocopherol) 60 IU, Vitamin K (as K1 (phytonadione) 27 mcg and K2 (menaquinone 7) 53 mcg) 80 mcg, Thiamin (Vitamin B1 (from Thiamine Mononitrate)) 15 mg, Riboflavin (Vitamin B2) 15 mg, Niacin (as Niacinamide) 30 mg, Vitamin B6 (from Pyridoxine Hydrochloride) 25 mg, Folate (as Quatrefolic 5-methyltetrahydofolic acid, glucosamine salt 1.9 mg) 1000 mcg, Vitamin B12 (as Methylcobalamin) 100 mcg, Biotin 300 mcg, Pantothenic Acid (as d-Calcium Pantothenate) 15 mg, Calcium (from Algae calcareas (plant), Calcium Ascorbate and Calcium D-Pantothenate) 34 mg, Iron (from Iron Bisglycinate) 27 mg, Iodine (from Potassium Iodide) 300 mcg, Magnesium (from Magnesium Oxide and Magnesium Citrate) 20 mg, Zinc (From Zinc Gylcinate Chelate) 11 mg, Copper (from Copper Glycinate Chelate) 1 mg, Selenium (from Selenium Yeast) 35 mcg, Manganese (from Manganese Glycinate Chelate) 2 mg, Chromium (from Chromium Picolinate) 400 mcg, Molybdenum (from molybdenum glycinate chelate) 37.5 mcg, Docosahexaenoic Acid (DHA) (fish Oil) 300 mg, Lutein Zeaxanthin Complex 0.9 mg, Choline (From Choline Bitartate) 25 mg; Other Ingredients: Fish gelatin, glycerin, yellow beeswax, medium chain triglycerides, purified water, soy lecithin, organic coconut oil, annatto, caramel color. Contains: Fish (menhaden tilapia), soy. 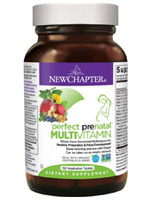 New Chapter Perfect Prenatal Multivitamin 9.1 $40.50 192 Take 1 tablet 3x daily. 3 64 $0.63 Yes Yes Vegetarian Yes 1300 mcg 100% 75 mg 63% 25 mcg 167% 20.9 mg 110% 90 mcg 100% 1.4 mg 100% 1.6 mg 100% 18 mg 100% 5 mg 250% 540 mcg DFE 90% 75 mg 6% 15 mg 4% 6.5 mg 50% 70 mcg 100% 27 mg 100% 0 Vitamin A (100% as beta-carotene from ferment media) 1300 mcg, Vitamin C (as ascorbic acid from ferment media) 75 mg, Vitamin D3 (as cholecaciferol from ferment media) 25 mcg, Vitamin E (as d-alpha-tocopheryl acetate from ferment media) 20.9 mg, Vitamin K (as phylloquinone [K1] from ferment media and as menaquinone-7 [k2] from natto) 90 mcg, Thiamin (as thiamin hydrochloride from ferment media) 1.4 mg, Riboflavin (from ferment media) 1.6 mg, Niacin (as niacinamide from ferment media) 18 mg, Vitamin B6 (as pyridoxine hydrochloride from ferment media) 5 mg, Folate (as methofolate, and as 105 mcg folic acid from ferment media) 540 mcg DFE, Vitamin B12 (as cyanocoblamin from ferment media) 3 mcg, Biotin (from ferment media) 35 mcg, Pantothenic Acid (as clacium D-pantothenate from ferment media) 7 mg, Calcium (from Algae Lithothamnion calcareum) 75 mg, Iron (as ferrous fumarate from ferment media) 27 mg, Iodine (as potasium iodide from ferment media) 150 mcg, Magnesium (as magnesium oxide form ferment media and Lithothamnion calcareum) 15 mg, Zinc (as zinc oxide from ferment media) 6.5 mg, Selenium (as selenium dioxide from ferment media) 70 mcg, Copper (as copper sulfate anhydrous from ferment media) 0.65 mcg, Manganese (as manganese chloride from ferment media) 2.6 mg, Chromium (as chromium chloride from ferment media) 45 mcg, Molybdenum (as sodium molybdate from ferment media) 20 mcg;, Prenatal Herbal Blends(from ferment media) 225 mg: Organic Brown Rice, Organic Oats, Organic Bllueberry (fruit), Organic Prune (fruit), Organic Blackberry (fruit), Organic Flame Raisin (fruit), Organic Raspberry (fruit), Organic Dandelion (leaf), Organic Rose Hip (fruit), Organic Lavender (flower), Organic Lemon Balm (leaf), Organic Peppermint (leaf), Organic Clove (bud); Cruciferous Sprouts Blend 100 mg: Organic Broccoli (sprouts), Organic Cauliflower (sprout), Organic Kale (sprout), Organic Daikon Radish (sprout), Organic Cabbage (sprout), Organic Mustard (sprout); Ginger Ginger (rhizome) 50 mg aqueous extract and 12 mg organic supercritical extract 62 mg, Organic Turmeric (rhizome) from ferment media 38.25 mg; Other Ingredients: Ferment media (organic soy flour, organic gum acacia, organic Saccharomyces cerevisiae, organic maltodextrin, organic orange peel powder, organic molasses, organic carrot powder, papain (deactivated), bromelain (deactivated), lactic acid bacteria [Lactobacillus acidophilus, Bifidbacterium bifidum and Lactobacillus rhamnosus], organic alfalfa powder, prenatal probiotic combination [Lactobacillus casei, Lactobacillus plantarum, Lactobacillus salivarius, Lactobacillus acidophilus, Lactobacillus rhamnosus, Streptococcus thermophilus, Bifidobacterium bifidum, Bifidobacterium infantis, Bifidobacterium longum and Bifidobacterium breve] and organic safflower oil), organic gum acacia, silicon dioxide, magnesium stearate, lac resin and carnauba wax. 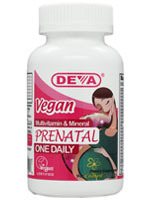 Deva Vegan Prenatal Multivitamin 9 $10.22 90 Take 1 tablet daily. 1 90 $0.11 No No Vegan No 3750 IU 75% 120 mg 200% 400 IU 100% 30 IU 100% 20 mcg 25% 12.5 mg 833% 12.5 mg 735% 45 mg 225% 12.5 625% 550 mcg 138% 100 mg 10% 40 mg 10% 15 mg 100% 70 mcg 100% 21 mg 118% 0 Vitamin A (Beta Carotene) 3750 IU, Vitamin C (Ascorbic Acid) 120 mg, Vitamin D2 400 IU, Vitamin E (D-Alpha Tocopherol) 30 IU, Vitamin K (Phytonadione) 20 mcg, Vitamin B1 (Thiamine Mononitrate) 12.5 mg, Vitamin B2 (Riboflavin) 12.5 mg, Vitamin B3 (Niacinamide) 45 mg, Vitamin B6 (Pyridoxine Hcl) 12.5 mg, Folic Acid 550 mcg, Vitamin B12 100 mcg, Biotin 150 mcg, Vitamin B5 (D-Calcium Pantothenate) 25 mg, Calcium (Calcium Carbonate) 100 mg, Iron (Amino Acid Chelate) 21 mg, Iodine (potassium iodide) 150 mcg, Magnesium (Oxide) 40 mg, Zinc (Oxide) 15 mg, Selenium 70 mcg, Copper (Gluconate) 2 mg, Manganese (Amino Acid Chelate) 2 mg, Chromium (Amino Acid Chelate) 120 mcg, Molybdenum (Amino Acid Chelate) 75 mcg, Boron (Citrate) 1 mg, Choline (Bitartrate) 50 mg, Inositol 10 mg, Lutein 50 mcg, Cinnamon Bark 10 mg, Citrus Bioflavonoids 10 mg, Apple Pectin 10 mg, Betaine Hcl 10 mg, Alfalfa [leaf] Medicago Sativa 5 mg, Chamomile (leaf) Matricaria Recutita 5 mg, Rose Hips Rosa Canina 5 mg, Acerola Extract Malphighia Glabra 500 mcg; Other Ingredients: Cellulose, Vegetable Stearic Acid, Croscarmellose Sodium, Vegetable Magnesium Stearate, Silica, Vitamin B2 (Riboflavin) coating. (All of the ingredients are from non-animal sources). Rainbow Light Prenatal One 8.9 $41.96 150 Take 1 tablet per day while pregnant or nursing. 1 150 $0.28 No No Vegetarian Yes 1305 mcg 100% 65 mg 54% 15 mcg 100% 9.5 mg 50% 90 mcg 100% 8 mg 571% 8 mg 500% 18 mg 100% 10 mg 500% 600 mcg DFE 100% 50 mg 4% 50 mg 13% 13 mg 100% 70 mcg 100% 27 mg 100% 0 Vitamin A (as beta-carotene) 1305 mcg, Vitamin C (as ascorbic acid) 65 mg, Vitamin D (as ergocalciferol) 15 mcg, Vitamin E (as d-alpha tocopheryl succinate) 9.5 mg, Vitamin K (as phytonadione) 90 mcg, Thiamin (as thiamin mononitrate) 8 mg, Riboflavin (vitamin B2) 8 mg, Niacin (as niacinamide) 18 mg, Vitamin B6 (as pyridoxine hydrochloride) 10 mg, Folic Acid (as folic acid) (360 mcg folic acid) 600 mcg DFE, Vitamin B12 (as methylcobalamin) 9 mcg, Biotin 35 mcg, Pantothenic Acid (as calcium pantothenate) 10 mg, Choline (as calcium bitartrate) 55 mg, Calcium (as calcium citrate) 50 mg, Iron (as iron amino acid chelate) 27 mg, Iodine (from kelp) 290 mcg, Magnesium (as marine magnesium extract from sea water) 50 mg, Zinc (as zinc citrate) 13 mg, Selenium (as selenomethionine) 70 mcg, Copper (as copper amino acid chelate) 1.3 mg, Manganese (as manganese citrate) 2 mg, Chromium (as chromium picolinate) 45 mcg, Molybdenum (as molybdenum amino acid chelate) 50 mcg;, Organic Organic Rainbow Vibrant Foods Blend 125 mg: Organic Spirulina, Organic Beet (Root), Organic Broccoli (Plant), Organic Kale (Leaf), Organic Spinach (Leaf), Organic Blackberry (Fruit), Organic Blueberry (Fruit), Organic Carrot (Root), Organic Cranberry (Fruit); Digestive Support Blend 32 mg: Ginger (Root) Juice Extract, Amylase (150 DU), Protease (600 HUT), Xylanase (80 XU), Maltase (4 DP), Glucoamylase (0.4 AGU), Hemicellulase (615 HCU), Beta-Glucoside (18 BGU), Phytase (0.04 FTU), Cellulase (24 CU), Alpha-Galactosidase (4 Galu), Lipase (22 FIP), Lactase (7 ALU), Invertase (3 (SU), Bacillus Coagulans MTCC 5856 (25 Million CFU); Citrus (Fruit) Bioflavonoids 25 mg, Organic Chlorella 25 mg, Inositol 10 mg, Boron (as boron glycinate) 1 mg; Other Ingredients: Microcrystalline Cellulose, Coating (Hypromellose, Hydroxypropyl Cellulose), Croscarmellose Sodium, Magnesium Stearate, Silica, Hydroxypropyl Methyl Cellulose.